Beyond Bath Time - Giveaway x3! Mrs. Davis generously offered up THREE copies of her new book. If you would like to win, simply leave a comment on this post, including a valid e-mail address. (It would also be nice if you read the review before blindingly entering the contest.) This contest is open to U.S. Residents only and will be open through Monday, May 14th. I will select a winner from the comments left on THIS post next Monday evening. Thank you, Erin Davis, for your generosity and desire to affirm and encourage other mothers! Read your review yesterday and think it might be an encouraging book. I didn't care for play dates when my girls were little, either--talk AND mind the kids? Too hard! Too distracting! Now that mine are a little older (well, the first two, anyway), it's a bit easier, though now we have to deal with hurt feelings, someone being left out, etc. I said all that to say sign me up! It really does sound like an encouraging book and when I read the review yesterday I thought "I should pick up a copy of that for _____, I bet that would encourage her." How nice of the author to offer giveaway copies! Sounds like a terrific book for this mama! 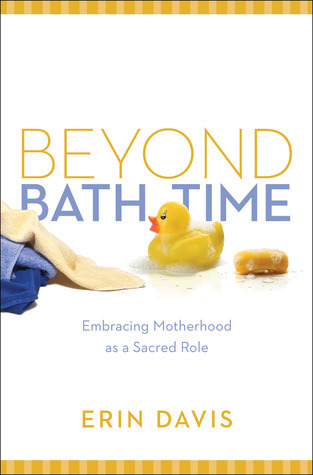 Erin here, author of "Beyond Bath Time." I'm loving your enthusiasm. Wishing I could give a copy to each and every one of ya. Thanks for being great moms. I'm always looking for books for when my DIL finally has kids. I got to hear Erin last night on Revive our Hearts and the message she shared was exactly what I needed. Can't wait to read Beyond Bath Time!